Earth's magnetic field is constantly changing, and while large-scale changes, such as a complete reversal of the magnetic field, happen over several thousand years, smaller changes over shorter periods affect navigation, including for aviation. This shifting magnetic field affects airports and airline operations and causes runway names to change. For example, the Fairbanks International Airport in Alaska renamed runway 1L-19R to 2L-20R in 2009 when magnetic north shifted enough to mandate a change. And the airport operators know—from NCEI’s World Magnetic Model and other sources—that they'll likely need to update the name again in 2033, according to a spokeswoman for the airport. That model, developed by NOAA and its partners, provides guidance for many who need accurate navigation tools. The World Magnetic Model (WMM) is a data-based, mathematical representation of Earth’s large-scale magnetic field used for navigation, orientation, and heading references. It’s critical to virtually every smartphone’s map apps and is the standard navigation tool for the Federal Aviation Administration (FAA), U.S. Department of Defense, North Atlantic Treaty Organization (NATO), and more. NCEI and the British Geological Survey produce an updated model every five years. “Several agencies use the World Magnetic Model to update their navigation aids with our software and online calculators,” says NCEI’s Arnaud Chulliat, a scientist affiliated with the Cooperative Institute for Research in Environmental Sciences (CIRES), who leads the project. The World Magnetic Model is a large-scale representation of Earth’s magnetic field. Graphic courtesy of NOAA NCEI. The data that go into the WMM come from many sources, primarily satellite observations and a global network of 120 magnetic observatories. Satellites help scientists separate various contributions to the magnetic field, according to Chulliat. Earth’s core contributes to the magnetic field, but so do magnetic rocks in Earth’s subsurface and electrical currents in the atmosphere and beyond. Why Does the WMM Need Updating? Earth’s inner core is solid, while the outer core is liquid. Both are primarily made of iron and nickel; flows within the outer core generate 95 percent of the geomagnetic field, including the slow, secular variation that is tracked by the WMM. Fluxes in the outer core trigger unpredictable changes in Earth’s magnetic field. Over the past few decades, the North magnetic pole has been drifting toward Siberia at an irregular speed, and that affects navigation accuracy. Updates to the WMM ensure accurate magnetic field declination—the difference between true north and magnetic north. Earth’s inner core is solid, while the outer core is liquid and can trigger changes in the magnetic field. Courtesy of European Space Agency and ATG/Medialab. NCEI scientists and their partners continuously survey the magnetic field to precisely map the present field and its rate of change and then extrapolate changes into the future. The team issues major updates every five years; the 2020 update will come out at the end of 2019. The aviation industry relies on magnetic compasses as primary instruments for navigation, alongside GPS instruments, so shifts in Earth’s magnetic field affect many aspects of aircraft navigation, including instrument landing systems, air traffic procedures, and runway designations. Airport runways are perhaps the most visible example of a navigation aid updated to match shifts in Earth’s magnetic field. By FAA rules, runways are numbered according to the points on a compass, from 1–36, reflecting the magnetic compass reading to the nearest 10 degrees and dropping the last digit. 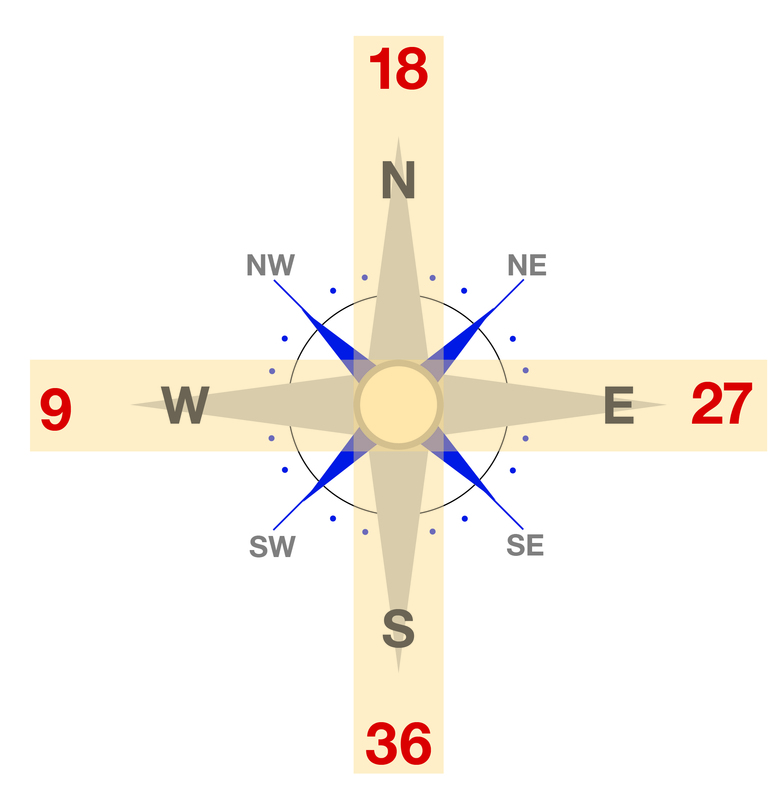 In addition, runway numbers are connected to the direction a plane is traveling—so while on a handheld compass, south corresponds to 180 degrees, or 18 in runway terms, if a plane is on runway 18–36, then it’s heading north, according to the designation on a compass with the runway overlay (see image below, courtesy of CIRES). Large airports have other designators, too, such as L or R for the left or right runway in a parallel pair. For pilots and other navigators, keeping runway names updated is crucial to accurately reflect the magnetic heading. Take Denver International Airport (DIA) runway 17L–35R, which is currently magnetically oriented at 172.5 degrees, according to a DIA spokesman. When magnetic shifts nudge that bearing by another 4 degrees to 176, that runway will become 18L–36R. Runway names are alphanumeric based on compass points. Courtesy of Wikimedia Commons. Magnetic shifts happen faster the closer to the poles you go, so airports at high latitudes must make more frequent adjustments than airports closer to the equator. For Fairbanks International Airport, for example, the interval of change is roughly every 24 years. The overall goal for all navigational aids, according to guidelines in FAA Order 8260, is to keep the magnetic variation figure used for guidance as closely aligned to the current computed value as modeled by the World Magnetic Model, within 1 degree, plus or minus. The WMM team consults regularly with FAA employees who use the model to update runways and other navigation systems. “The FAA uses our model to determine the magnetic field at certain locations and points in time, then sets their instruments and other navigational aids at these points,” Chulliat says. The NOAA NCEI team provides its customers with the WMM and associated software that they can download and use, embed in other systems, or use to write software of their own. There’s also an online magnetic field calculator into which a user can enter a set of coordinates to get a precise magnetic field value for that location.